Do you want a rustic antique look but not the antique price? Pair one of our rustic, circle-sawn Sawmill dressers with Antique Barnwood finish (as pictured) and you'll have the reclaimed barn wood look without the barnburner prices. This rustic piece features solid, pine construction and spacious drawers that easily glide open and closed. You'll have room aplenty to store all your favorite hunting and fishing outfits. The sturdy Sawmill Bedroom Collection can be the foundation for your new cabin, lodge, or home rustic decor. 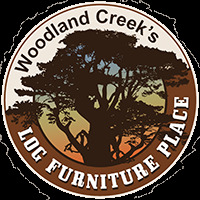 Solid, strong, and hand-crafted, our rustic log & real-wood furniture is built to last generations.